Solar PV and thermal – a marriage made in heaven? Concentrated solar can provide higher water temperatures than standard, non-concentrating, systems. ICEC's hybrid HYSOLAR can be used on roofs and be integrated in facades. PV output vs PV cell temperature. By placing a solar thermal collector behind a solar photovoltaic (PV) array, the PV cells can be cooled. At the same time, the solar collector can harvest most of the energy that passes through the array that would otherwise be lost, recovering it for productive use. The collector transfers captured energy to a circulating medium, fluid or air that in turn takes it to somewhere it can be stored or used, such as a hot water tank, a building space, or to the ground for later retrieval by heat pump. 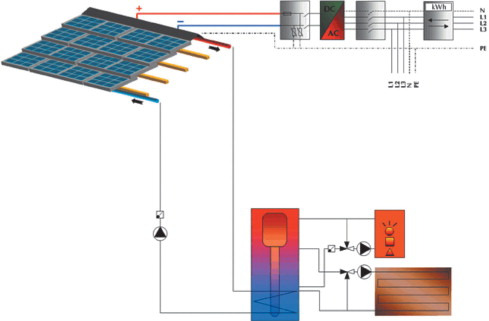 In this happy scenario, the solar PV cells are cooled by contact with the solar thermal collector to a more optimum operating temperature, ideally about 25°C. In providing both thermal and electrical forms of energy, the marriage results in a solar co-generation process. The concept is appealingly simple and logical. Though for an industry steeped in the technologies of separate devices, it has taken some time for the penny to drop. It can be a revelation when it happens. Take, for example, the case of Al C. Rich, who devised the Skyline solar thermal collector produced by the company he founded, SolarRoofs.com Inc. He describes solar hot water and solar electric systems as perfectly complementary, amounting to a power and conservation resource that can make a real difference to (conventional) energy requirements. The combination, he says, makes more effective use of valuable roof space, the collector part of the system more than doubling the output power per square metre due to the solar PV component alone. John Hollick, Head of Canadian company Conserval Engineering agrees, asserting that PV-thermal (PV-T) systems can generate four times the energy produced from the same surface area for only a 25% increase in cost. While costing more than a single unit of either type, a combined unit can be produced much more affordably than two separate thermal and PV units. Hollick also emphasises the diseconomy of not cooling solar PV arrays, pointing out that for every degree rise above 25°C, electrical output drops by up to half a percent. Thus, a typical rooftop PV array at 55–75°C would deliver 15-25% less electricity. If the temperature was to rise to 80°C, quite possible in direct strong sunlight, an array rated at 10 kW might deliver little more than 7 kW. Using the hybrid solution to control the solar PV temperature while also exploiting the ‘waste’ heat productively, can reduce solar PV payback periods by between a third and a half, Hollick argues. Furthermore, a combined system is likely to be aesthetically more appealing than a solar thermal system alone, being enhanced by the ‘high-tech’ solar PV overlay and leading to a more uniform roof array. Because of the advantages offered by PV-T, Vinod Khosler, well known as the Founder of Sun Microsystems but subsequently an alternative energy entrepreneur, has described the hybrid approach as “a gargantuan leap in a field where engineers exult over the most incremental gains”. But, despite the fact that PV-T has been a focus for R&D for two decades – witness for instance the PV BONUS research initiative in the United States, the International Energy Agency Task 35 PV-T work and extensive investigations in Israel – the benefits of this leap have not yet become as widespread a some had hoped. Commercially, many solar companies have been fully occupied in meeting thermal and solar PV demand and improving their separate systems, while technically there have been issues such as maintaining the long-term stability of solar PV elements when used with solar thermal collectors. However, a number of products have begun to make headway commercially. PV-T collectors can be constructed similarly to solar thermal collectors, typically in a box with a glass cover, or can move more towards solar PV panel design, with less insulation and no glass cover. The latter concept might be expected to have a lower conversion efficiency than the former but higher electrical yield, and it will be more susceptible to output variation in windy conditions. In either case, the solar PV element can be amorphous or crystalline silicon based, conventional or thin-film, and made up of single, dual or triple-junction solar cells depending on conversion efficiency/cost trade-offs. The medium used to extract heat from the system's thermal absorber and cool the solar PV array can be a fluid, normally water, or air. Water, the conventional heat sink in solar thermal devices, is circulated through pipes arranged in serpentine fashion or wound circumferentially to have maximum surface area in contact with the black-surfaced absorber plate to which they are intimately attached. Continuations of these pipes pass either via a closed circuit into a hot water tank so as to heat domestic water, or into the ground from where it can subsequently be harvested by a ground-source heat pump. The circulation pump used to propel water round the closed circuit can be powered by the solar PV element, with mains electricity back-up if required. If, on the other hand, air is used as the heat transfer medium/coolant, the air used to ventilate the solar PV array can be transferred via a plenum and ducting to a building's space heating system, or passed to a heat exchanger where the thermal energy is extracted and stored in, for instance, night storage heaters or hot water. Air-based systems, in particular, lend themselves to architectural integration. In a building-integrated PV-T system, air passed over successive solar PV elements forming part of a roof or facade can then pass into a continuous-flow air chamber/duct. This avoids the need for multiple separate modules. Toronto-headquartered Conserval Engineering Inc is a proponent of this approach. Conserval modified its existing SolarWall® passive solar heating technology, in which solar radiation captured by a perforated metal facade heats air flowing behind the metal to provide warm air for the building, by placing solar PV panels over the facade – which is essentially a solar thermal collector. Tests carried out by the company indicate that the efficiency of the solar PV overlay is up to 10% higher, thanks to the cooling effect of the collector air, than it would otherwise be, while cooling the solar PV cells also protects them from overheat damage. According to Conserval figures, hybrid SolarWall PV-T typically produces 300–400 W/m2 of electricity and thermal energy, a quarter to a third of this being the PV/electrical component. A variant of this product is SolarDuct PV-T, a modular system intended for roofs and applications in which wall mounting is not possible. In Spain a solar wall installed at a public library near Barcelona, is made up of PV-T modules that were developed as standardised building elements by German company Phototronics SolarTechnic GmbH. Designed for vertical facades on residential and commercial buildings, PST's modules combine solar PV and thermal elements within an insulated glass sandwich. Air heat recovery is used. Denmark's Aidt Miljo A/S offers a smaller-scale air-based PV-T solution, in this case separate modules able to be retrofitted to buildings. Its SolarVenti hybrid comprises a solar collector and solar PV panel together with a fan for blowing air warmed by the solar PV into a roof space or room on which the unit is mounted. The ventilator can be controlled by a thermostat, fan speed regulator or manual switch. The company says the system is virtually maintenance free and recommends it for domestic and other premises, especially those that stand unoccupied for long periods, where it can combat cold, humidity, mould and rot. Units, available in four sizes, have a felt mat-over-perforated aluminium plate absorber beneath a 6, 12 or 18 W solar PV panel. There are also opportunities associated with silicon-saving thin-film PV, such as the peel-and-stick Uni-Solar® product from United Solar Ovonic. This is used to make metal roofs that produce electricity. 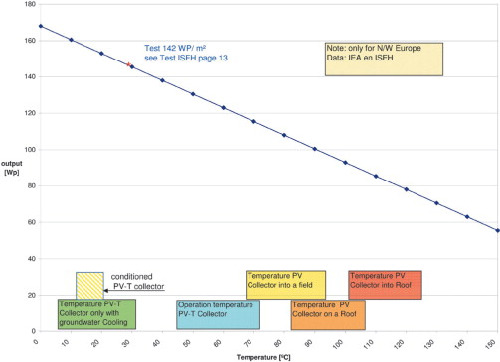 Adding an air collection plenum immediately below the roofing, along with a means of heat recovery results, de facto, in a building integrated PV-T (BIPV-T) system. Nevertheless, air-based systems do not have a monopoly of building-integrated PV-T since fluid-based systems are also in use. An example is HYSOLAR® from the International Clean Energy Consortium, headquartered in Switzerland. ICEC's hybrid technology is suitable for roof and facade integration and is also available in separate module form. Among other firms espousing water is Solimpeks Solar Energy Corp in Turkey, with its Volther hybrid collectors. According to R&D Manager Joop Hoek, just 25 m2 of PV-T collector can provide all the energy required by a normal family house in northern Europe throughout the year if surplus electricity is stored in batteries or fuel cells and heat is stored in the ground and recovered in cold weather by a heat pump. Available in two sizes, of 175 W and 750 W ratings, Volther collectors have monocrystalline solar PV panels and an absorber with copper strip heat exchanger, each unit being housed in an aluminium box with low-iron tempered glass cover. Holtkamp Solar Energy Systems Co in Germany markets its PV-T Combi Collector series in three sizes, providing 180 We/2295 Wth, 360 We/1530 Wth and 180 We/765 Wth. The system combines 72, 144 or 216 monocrystalline silicon cells with solar thermal collectors and uses water as the heat exchange/cooling fluid. Israeli company Millenium Electric Ltd (formerly Chromagen Solar Energy) has utilised both air and water as heat transfer media. In different versions, mono or polycrystalline silicon solar PV arrays produced by the company are cooled by air or water, yielding up to 30% more power annually than regular solar PV panels alone under similar conditions. According to Millenium, an integrated PV-T collector hybrid can return an overall conversion efficiency of 85%. One of its baseline PV-T panel products has outputs of 340 We and 1.5 kWth. Both residential and commercial-scale systems can be grid-connected. The company, which sees PV-T as the next big step forward in solar, also envisions implementing the co-generation technology on a utility scale. Thus, it has developed a system in which both forms of energy are utilised to heat water to form steam for driving a steam turbine, which is connected to an electrical generator. The marriage between solar PV and solar thermal can be enriched still further by solar concentration. 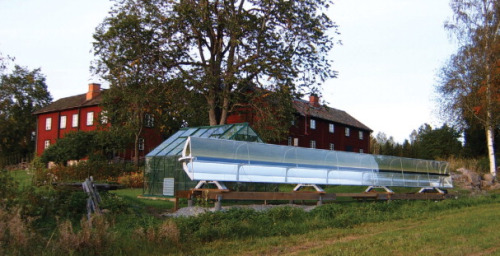 When Swedish firm Absolicon Solar Concentrator AB named its flagship hybrid product the Absolicon X10, this denoted the level of sun ray concentration provided by a parabolic trough reflector within which the ‘double-solar’ PV-T combination is mounted. The X10 is offered in four different lengths: 6, 10, 14 and 18 metres and units can be linked for series installations. Systems are working in a variety of settings including a forestry centre in Spain, a country home in Sweden and a facility in Seville, Spain, where stand-alone ground installations are in place, associated in at least one instance with heat storage in the ground. Concentrated solar can provide higher water temperatures than standard (non-concentrating) systems. Cambridge-headquartered HelioDynamics uses linear Fresnel reflectors in its solar concentrators and, with Israeli firm Zenith Solar, is reported to have developed a high-concentration PV-thermal (HCPV-T) that can produce steam for running a turbine or enough hot water to run through an organic Rankine cycle generator, with waste heat still available for water, space or process heating. No marriage is perfect and that between solar PV and solar thermal is no exception. For a start, the two types of generation are non-complementary in the sense that both become unproductive together when solar gain is low, such as during winters in northern Europe and other territories at similar latitudes. This is, of course, when the requirement for generated heat and light is greatest. Installing a system requires both piping and cabling for thermal and electrical circuitry, and hybrid units may be bulkier and heavier than separate units. Any failure of the coolant to circulate through blockage, leakage or other reason, could result in damage to the solar PV array through overheating. However, given its compelling advantages – the improved exploitation of available solar energy, the avoidance of competition between the two component technologies for scarce roof space, and the provision of both thermal and electrical energy – the hybrid technology could bring us nearer the time when solar-derived renewable energy can compete economically with present conventional energy sources. Solar PV and Thermal are complementary but not contradictory. The Japanese big PV companies were doing work on this in the late 80s early 90s. To cool a PV panel to 25°C you are likely to need coolant at 20°C or less and, bearing mind the typical low efficiencies of PV panels, in normal circumstances a lot of heat is generated giving large quanities of very low grade heat. It would be far better to use super efficient solar thermal panels and generate electricity from high grade heat and use the waste heat for heating and cooling purposes.